M.V.Sc. in Veterinary Parasitology is a 2 Year Post Graduate course in the domain of veterinary sciences with a special focus on the area of parasitology and its role in veterinary diseases. A minimum of 60% (relaxable for reserved category candidates) marks at UG (Under Graduation) level is the least which almost all the institutes desire from applying candidates as the eligibility criterion. The range of average fee for the course varies between INR 45,000 to INR 3, 00,000 in India. The variation in fee is based on the location and nature of university (that is government, state/private/deemed etc.). Admissions to the course are done based on Common Entrance Test (CET) based selection method as well as merit-based selection criteria that is the percentage of marks obtained at Under Graduate (UG) level. Most of the colleges who provide admissions through CET mechanism rely on the score of national level common exams like TANUVAS (Tamil Nadu Veterinary and Animal Science University Common Entrance Test) or go for a separate entrance exam of their own (Like Agriculture University of Kerala). The course is designed to provide requisite skills and knowledge to the master’s level students that would be required for the effective and efficient application of their abilities in the domain of veterinary sciences as a part of their professional career. M.V.Sc. in Veterinary Parasitology postgraduate has a wide range of job opportunities to choose from. One can choose to work with firms and establishment such as research labs, disease control centers, veterinary hospitals, Colleges, etc. After completion of post graduation, students can go for higher studies in the said subject or may take up job opportunities associated. The average salary ranges between INR 15,000 and 20,000 a month for a fresh pass out. Eligibility Minimum score of 60% (Relaxable for reserved category students) marks at UG level. Job Position Veterinary doctor, Pharmacist, Veterinary consultant, Animal Epidemiologist, Professor, Medical officer etc. M.V.Sc. in Veterinary Parasitology: What is it about? Veterinary Science as an area of study is focused and determined towards the study of animal life and its life process. The scope of the study includes a wide range of animal life process including, reproduction, development, genetic shifts, disease, recovery etc. Parasitology, on the other hand, deals with the study of parasites, their host, and the inter-relation between the two so, as to determine their impact on occurrence and cause of various parasitic disease in living beings. It acts as a specialized domain of medical science where treatment and rehabilitation form parasitic disease is focused upon. M.V.Sc. course in Veterinary Parasitology provides a platform where concepts of parasitology are seen discussed in the context of veterinary science and animal healthcare. Through the academic curriculum and practical modules, the course is determined to deliver professional veterinary doctors who are proficient in dealing with any emerging epidemiological challenge. M.V.Sc. in Veterinary Parasitology is offered as a course by many reputed colleges/universities to candidates who have passed their UG examination in the respective domain from a recognized state or central University. Candidate must have passed the BVSc/Bachelor’s in Animal Husbandry final year examination from a recognized state/private/deemed or central University with at least 60% (relaxable for reserved category candidates) of the marks. He/She shall not be having any backlog or compartment in any of the Subject/Subjects at UG level that is yet to be cleared at the time of taking admissions. Apart from the above-mentioned eligibility criteria’s various colleges and institutes may have their own additional criteria’s which the students would have to satisfy in order to take admission (like work experience of certain years). Most of the Institute give admissions through Common Entrance Test (CET) (like Tamil Nadu Veterinary and Animal Science University Entrance Exam). To get admissions in these institutes candidates would have to qualify the respective entrance exam by securing minimum qualifying marks. The eligibility criteria’s mentioned above are common for most of the universities and colleges across the country that are offering this course to the students. M.V.Sc. in Veterinary Parasitology course admissions are done mostly through a common entrance test based admission process (as seen across various universities and colleges in the country). Most of the Universities/Colleges conduct a common entrance test for admission into MVSc courses (like Assam Veterinary and Animal Science University) or take admissions through commonly held entrance exam like TANUVAS. Hence students would have to make an application for such exams. The course is divided into four semesters spread over a span of two years. The syllabus is divided into various subjects and skill-based modules that students are taught during the course of their post-graduation. The syllabus covers all the aspects related to Veterinary Parasitology so as to provide a holistic understanding of the subject to the master’s level students. M.V.Sc. in Veterinary Parasitology: Who Should Opt for? Students who have an interest in the domain of Veterinary sciences or animal husbandry. 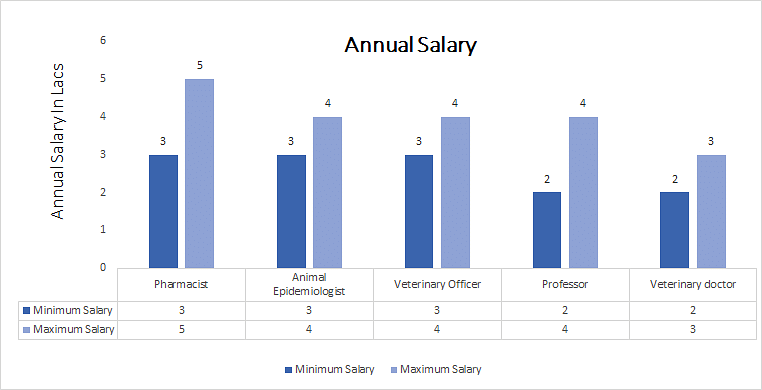 Those who have a career as a veterinary epidemiologist in mind. Those who are looking at research and development jobs in the field of animal healthcare. M.V.Sc. in Veterinary Parasitology postgraduates have plenty of options to choose from in terms of their career. One can choose to work as a Veterinary doctor, Pharmacist, Veterinary consultant, Animal Epidemiologist, Professor, Medical officer etc. To provide you a complete view of the career prospects of the course we have tabled certain areas and the respective roles attached to the same where M.V.Sc. postgraduates can look for in terms of their career.